This week’s photo was taken somewhere in Israel. I think it’s an interesting photo because the blue contrasts with the stone. If you take away the strong blue of the Israel/Mediterranean sky it’s pretty much monochrome, the Jerusalem stone buildings are all one tone. The great Louis Armstrong sings “I see skies of blue, clouds of white, bright blessed days, dark sacred nights” – seems like a good description. Can you recognize where this photo was taken? Leave a comment. You can click on the image for a larger view (which may take some time to load depending on your Internet connection). Please share this post via Email, on Facebook or Twitter by clicking on the icons at the end of this message. This photo was taken with a Nikon D90 DSLR camera and 18-70mm lens on November 21st, (ISO 200, 24mm, F11 at 1/500 sec). 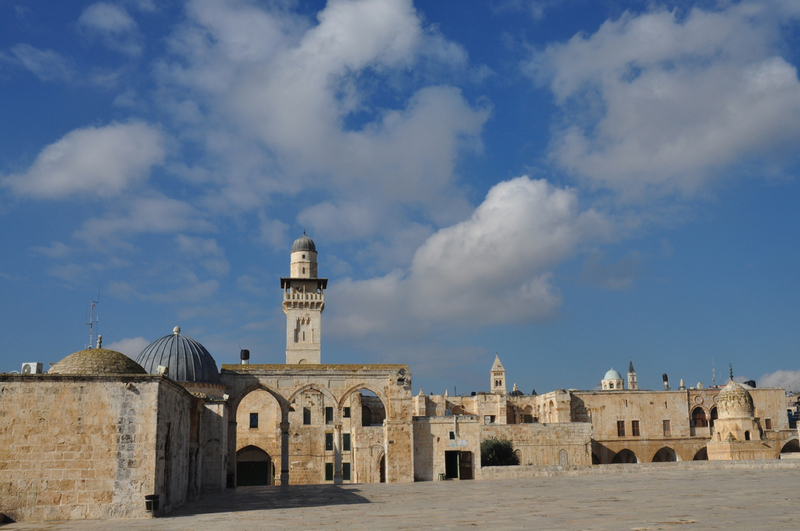 This entry was posted in Architecture, Photography and tagged blue skye, bright blessed days, clouds, dome, minaret on January 27, 2013 by Shmuel Browns. Looks like the platform around the dome of the rock.. but I’m not 100% sure. Looks like Acre to me. Any clear-thinking individual (one with an Internet search engine, anyway), would recognize this as the Fakhriya Minaret, near (as Tom says) the Dome of the Rock in Jerusalem.